These steps should help enable the mod_rewrite apache module for anyone running a local WAMP stack – Apache, MySQL & PHP on a Windows machine. I needed to do this with a local WordPress website which was setup to serve a number of friendly URLs using the .htaccess file. As the mod_rewrite module was not enabled, this prevented the .htaccess file from doing any URL rewriting, causing an error 404 page not found error on the WordPress site. Find any additional occurrences of the line “AllowOverride None” and change it to “AllowOverride All”. 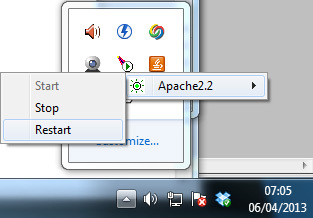 Finally, restart apache server and your browser. The .htaccess rewriting should now be working for any local website or WordPress install instead of displaying the page not found error. I’ve been looking for a way to update the .htaccess file for a while, and now it works !!! I made the changes accordingly in httpd.conf but the wamp server wont restart. Thankyou So much I have been searching for a long time. Didn’t work. Still getting the error. This really helped me, thanks!! Does all the rewriting types running ?? i m looking for rewrite a dynamic url to a static url and it doesn’t work !! 5. Find any additional occurrences of the line “AllowOverride None” and change it to “AllowOverride All”. Thank you its really helped me. Apache wont restart after doing this… any fix suggestions? Dude,This is fine with the windows users. Just to add to this – it works fine, but if you’re doing this for WordPress (like I was), you don’t have to edit AllowOverride to All everywhere. It only needs to be set for the Directory that your WordPress files are in. About “AllowOverride All”, should suffice to set it for the document root directory.